Poll results, from the opinion questions, for the “Jira Scary Stories” presentation. How would you handle independent projects? Would not have clicked "Buy Now"
How would you improve this situation? 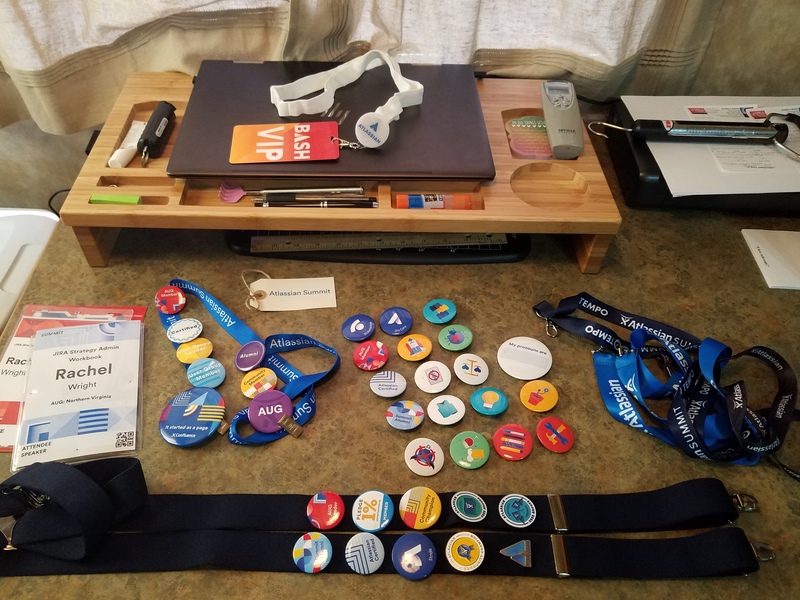 After attending every Atlassian Summit user conference since 2013, I’ve acquired a lot of buttons, or “Summit flair” as I call them. 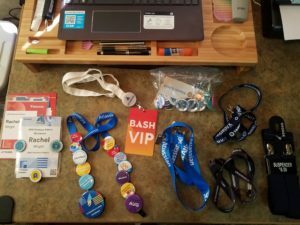 I’ve run out of room for them on my conference lanyard however, and honestly, they were getting heavy! So this year, I needed a different solution. How could I display my flair? I thought for a while and came up with nothing. Then, somehow, I thought of suspenders! Now, being a girl, and never being a farmer, I’ve never worn this contraption. But I asked my boyfriend where I could get them and we found some in the men’s section at Walmart. $6.50 USD later and I had a craft project! Follow along below to make your own. Realize you don’t know how to wear suspenders and watch many YouTube videos until you can successfully adjust the length. Learn that women should wear thinner versions. Ignore that tip; it won’t be the first time you’re not “on trend” in fashion. 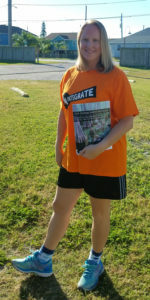 PS – A wardrobe of only Atlassian t-shirts is always “on trend”! Your Summit hording pays off! 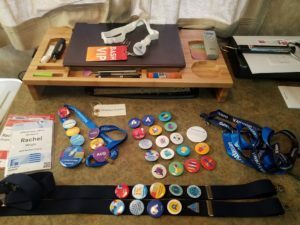 You have 4 lanyards from previous Summits ready for a second life. 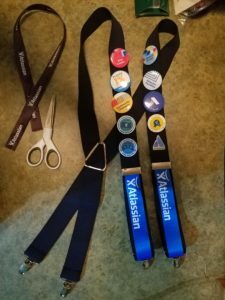 Realize you’ve collected far too many Atlassian pins though. Choose your favorite ten, give the other twenty a hug, and put them away. Realize that you travel full-time in an RV so craft materials are scarce. This is the one time where a can of WD-40, a drill, and awning repair tape won’t fix it. Look in the tool box and the office supply drawer. Find a glue stick, a needle, less than a yard of thread, scissors, permanent markers, a seam ripper (why is this needed in an RV? ), a label maker, safety pins, a putty knife, and something called “Super Weld.” Put half of that stuff away because it won’t help this project. Use the scissors to cut the lanyard fabric from its hardware. It frays immediately. Run back to the tool box and find the “Super Weld.” Use it as super glue on all the lanyard ends. Do it quick because it’s unraveling! Try not to super weld fingers together. Use the needle and scarce amount of thread to affix the lanyard to the suspenders. Realize that you haven’t sewed anything since seventh grade home economics class. Remember? You attempted to make jean shorts. Floral. Denim. Shorts. Horrific! How did you even pass that class? With the pins and two pieces of lanyard on the front, it’s time to decorate the back. People standing behind you need to know about your Atlassian devotion too! 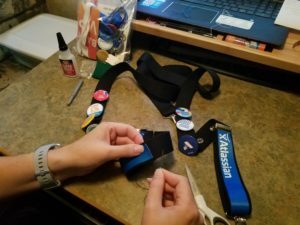 Resist the urge to glue the remaining lanyard with the “Super Weld.” Sew a few stitches with the remaining inches of thread. Curse loudly as you struggle to knot the thread by the dim light of a lantern. Only stab yourself with the needle once. Impressive! If this Jira consulting thing doesn’t work out, maybe you can be a seamstress? It’s way past your bed time but you have a completed an almost respectable attempt at custom suspenders. Costs, injuries, and permanent damage to the RV is minimal. Congratulations! All that’s left now is to put them on and get yourself to Atlassian Summit! 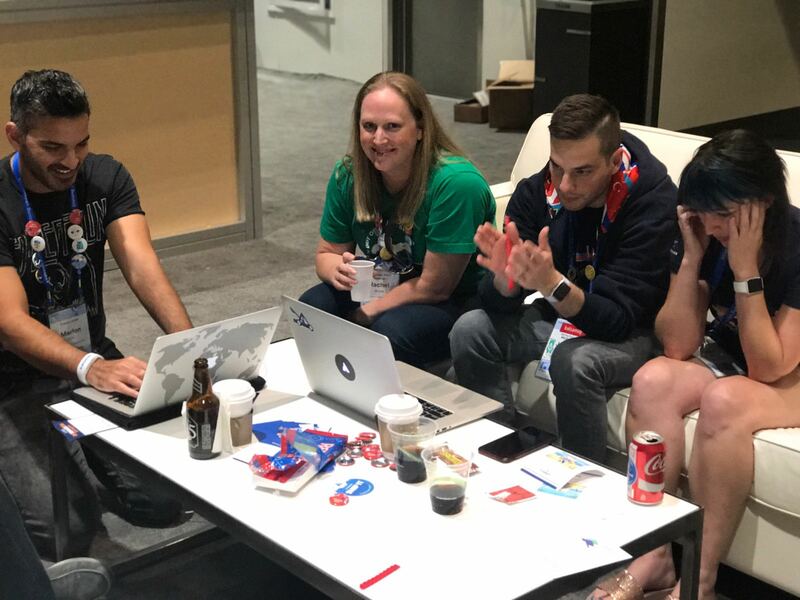 Will you be at Atlassian Summit, in Barcelona, the week of September 3, 2018? 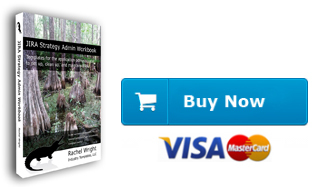 Meet Rachel Wright and win her Jira Strategy Admin Workbook or one of 5 new training courses! Rachel will be hard to miss with her custom-made Summit suspenders. Find her in these locations. 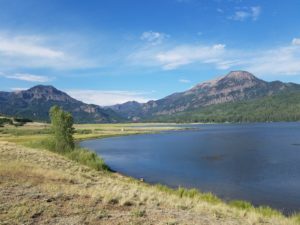 We did a retrospective on our boondocking adventure, using Confluence’s template. These are the results. 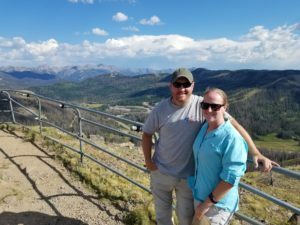 Overall, we met our goals of living off the grid for one week. By gaining boondocking skills and equipment we’ve enabled ourselves to camp in different types of locations. City power, water, and sewer are no longer a limiting factor. 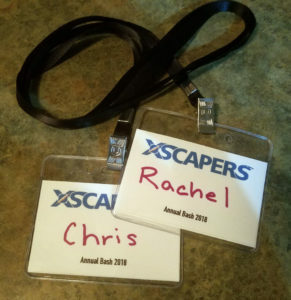 We also had fun networking with other full time campers. We were so confident with our experience that we decided to try it again immediately. We needed a one night stop between Pagosa Springs, CO and Santa Fe, NM. We searched the online camping directories and decided on a free overnight spot, in a municipal park, near the half way point. The location was excellent and we had the entire park to ourselves. How could this go wrong? We neglected to check the weather report. RVs and travel trailers heat up very quickly, just like a vehicle does. When it gets hot, you put our your awning, unfold your camping chair, and work outside until the sun goes down. It’s not too bad if you also have a cold glass of iced tea to enjoy. 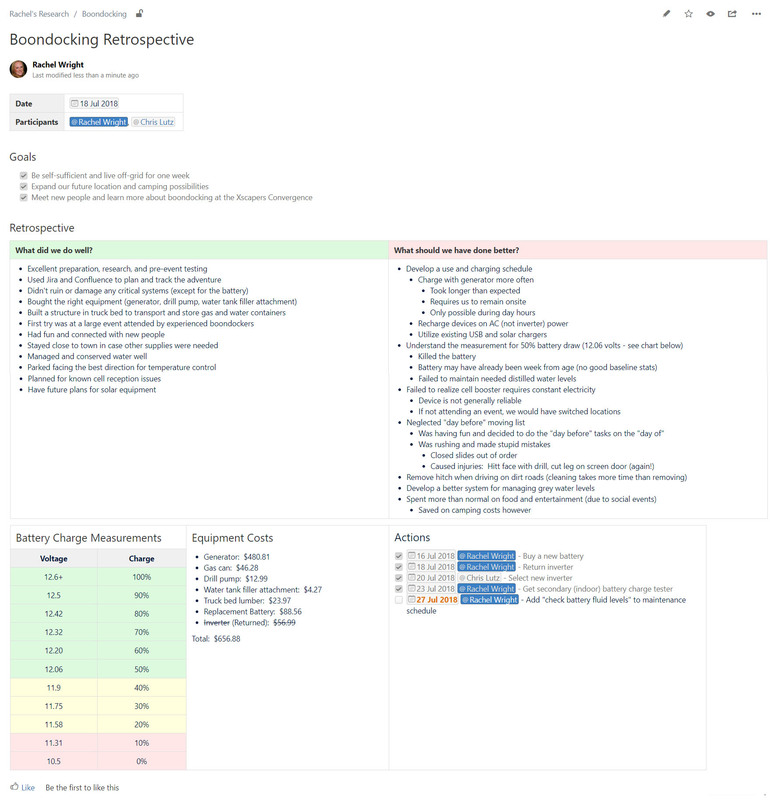 I hope you enjoyed following along on our adventure and alternate use of Jira and Confluence. Atlassian tools can track anything! I encourage you to experiment with alternate uses from both your work and personal life. Happy Jira issue and Confluence page creating! 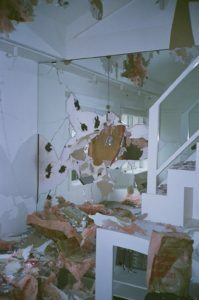 In 2006, my stationary house was hit by lightning. One strike sent electrical outlet face plates flying across the room and broke mirrored walls. The fire department opened walls with their axes, checking for internal fire. All the house’s appliances were fried. No more fridge, no more hot water heater, etc. The only electronics that survived were my computers, because they were connected to an APC battery backup and surge suppression system. The APC took the lightning strike – not my devices. From that experience, I don’t plug important devices directly into a wall outlet. But how do you handle surge and voltage fluctuation when you live in a travel trailer? The answer is you have to protect the entire dwelling. Power pedestals at campgrounds are notoriously problematic. They are wired incorrectly, deliver uneven current, shut off and on as they please, and frequently deliver too low voltage or too high voltage. It’s really easy to ruin everything. I will NEVER plug my travel trailer in without a Electrical Management System (EMS). The best is made by Progressive Industries. It is the one “must buy” thing for your RV! 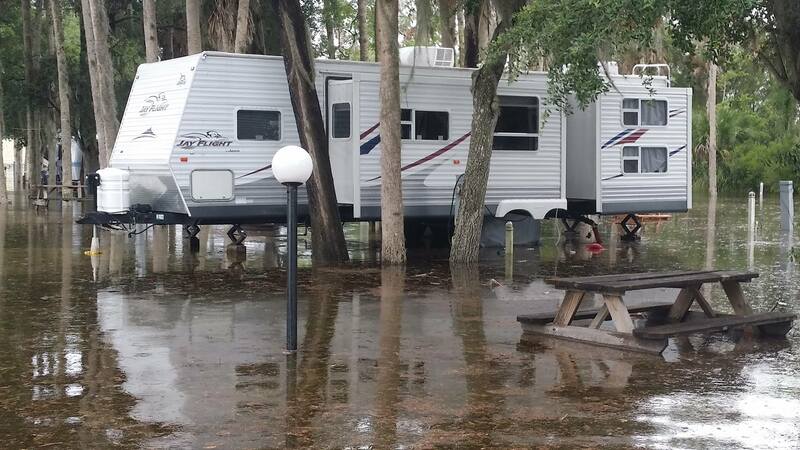 It’s saved our travel trailer and the items inside it from disaster twice. It’s worth every penny and more. BUT you can’t use an EMS with a generator! What??? We’re going to plug the trailer into something without my precious safety system? Queue my anxiety. Today was the big day where we’d use the new inverter generator for the first time. On the previous day, we tried plugging in an old fan first, just to make sure everything was working as expected. If the fan exploded, that would be alright but I wasn’t willing to take that chance with the entire travel trailer. Luckily, there were no explosions. In two days, our battery drained to 11.76 volts. That’s probably lower than we should have let it go. Time will tell if we’ve damaged it. To recharge the battery to 12.45 volts (under 100%) we ran the generator for 1h 45m and used 0.5 gallons of gas. After our morning generator fun, I joined the Convergence festivities. There 32 people and 28 “rigs” attending this off grid get together. “Rig” or “coach” is slang for your camping setup. 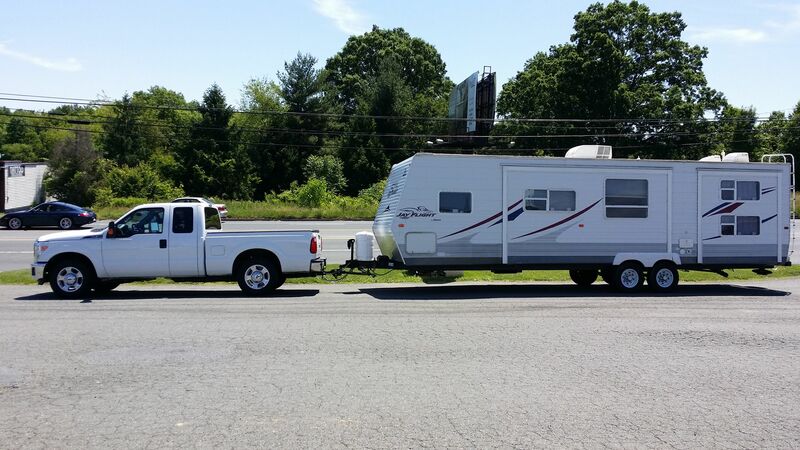 At the convergence, we have travel trailers (towed by a hitch on the bumper) like ours, fifth wheels (towed by a hitch in the bed of a truck), and motorized RVs of all sizes and configurations. The day’s activities started with a trip to the in hot springs which included a shower. I was excited to use someone else’s shower and not waste our water! Back at camp, we ate a “Taco Tuesday” pot luck dinner. It’s time to charge again. Our travel trailer is wired for 30 amp, which is a different plug than a regular house outlet. 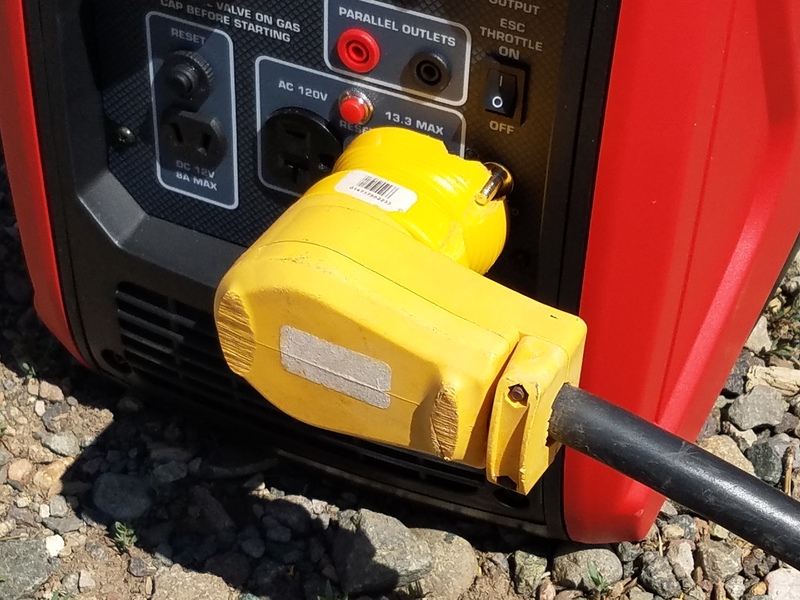 We have to use an adapter to connect to the generator. The adapter cuts our amp possibilities down by half. When connected to a normal power pedestal, we can run multiple things at a time as long as we don’t exceed 30 amps. We can use the microwave with the lights on. We can use the hot water with the radio on, etc. But with the generator and only half our amperage capacity (15 amps), we have to limit what we use. We did some tests and learned we can run the air conditioning, as long as we start the fan before the compressor and NOTHING else is running. We cannot run the microwave using the generator however. As shown in the picture, the generator has standard US wall outlets. There are two – the left one is empty and the right is used by our yellow trailer plug and yellow adapter. If you look closely, you can see we had to file down the adapter in two places to make it fit. The outlet on the left has a red button that’s in the way and the one on the right has a grounding screw in the way. Also pictured is where we had to file off the handle on the yellow trailer plug. The plug is a replacement and was too big to store with the original handle. This is typical of the RV lifestyle. You buy something perfectly nice and intentionally ruin it to make it work. I’m used to having my laptops plugged in all the time, so it’s pretty annoying to run out of power and have to wait until our next generator charge to be productive again. Today I got a bit of work done but was up against the laptop battery deadline. I stood up a new Jira instance but I was rushing and messed up the database part. I created the database with the wrong table collation. Jira requires “utf8_bin.” When Jira started up, it notified me of the problem. There are two options: recreate the database or change all the tables and columns. I opted for the latter. The needed queries are documented and it didn’t take long to fix. Some of the queries make the change and others generate a new set of queries to run. We’re also attending a “convergence” which is like a conference with fellow digital nomads. We’ve all parked together in the same place. If we fail at boondocking, we’ll do it surrounded by experienced campers. The week before our trip, we further tested our preparations. We were at a campground with full hookups, but instead of plugging in, we tested how long we’d last with conservative use of battery power and stored water. I quickly discovered a problem recharging the computers. My 12 volt inverter charger works perfectly in a (running, and therefore full battery) truck, but not so well on a dwindling trailer battery. Its 75 watt output could handle the Chromebooks and phones but couldn’t recharge my HP laptop. Also, it only has one outlet, which is inconvenient. I immediately upgraded to a 2,000 watt device with 3 AC and 4 USB outlets. Right now I only have a WiFi booster plugged in and its internal fan is running more often than I’d like. We’ll see if it works long-term. We’ll need to charge our trailer battery every day or every other day, to sustain the 12 volt system and recharge electronics. While boondocking, we can only use the 12 volt system, which powers the lights, water pump, and fire and carbon monoxide detection systems. It also generates the spark for propane appliances, like the fridge, stove, and oven. We won’t be able to use luxuries like the microwave, coffee maker, or air conditioner. When the trailer is briefly connected to the generator, we’ll be able to use the wall outlets to charge electronics. Our fresh water lasted 4 days with moderate use and 4 showers. We can easily extend that with conservation, including less dish washing and fewer showers. Our grey water tank lasted only 3 days. Storage of used water is an issue. We can extend capabilities by limiting how much water goes down the drain. Next week, we’ll need to use the outside shower and wash dishes outside to avoid storing excess water. Our black tank is never an issue. We can go a week or two without dumping it. We woke up, made a quick breakfast, and completed tasks from our Confluence “moving day” checklist. There are 32 things I do the day before any move like: verify our route, fuel the tow vehicle, and check the pressure on all tires. (The correct pressure is CRITICAL for trailer tires!) On moving day, there are another 52 items to complete like: draining all tanks, turning off the electric and propane systems, and properly coupling the tow vehicle to the trailer. My Confluence checklist is vital to the moving process. Missing any item could put us, others, or our property in danger while rolling down the road. We completed our standard checklist but this time one thing was different. We filled our fresh water tank, otherwise, we’d have no water at our next destination. 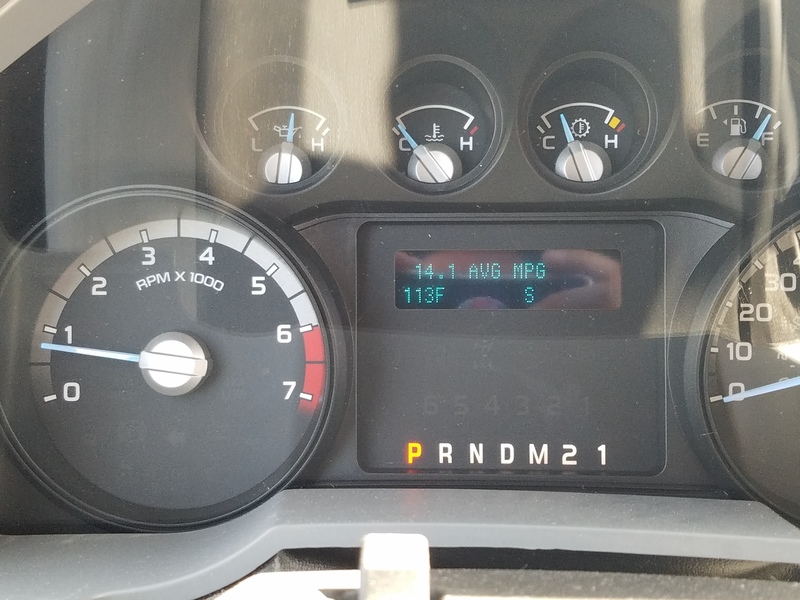 We’ve never traveled with a full tank before. Water is heavy and the extra 450 pounds means extra risk and even less gas mileage. Luckily our off-grid destination was only 10 miles away. We arrived and parking was much easier than usual. Usually you have to line up very carefully, so all your connections reach and you fit in the spot. 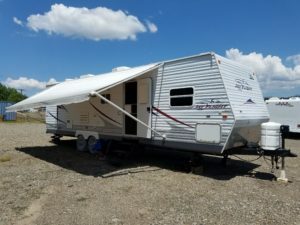 But with boondocking, there are no connections to worry about. We simply parked, drove up on leveling blocks, detached the tow vehicle, and opened our slides and awning. Voila – we’re camping! This night we met our fellow convergence attendees and cooked dinner together on many grills. There’s a fire ban in this part of Colorado, so only propane grills are allowed. So far so good! I’m able to launch Jira, Confluence, and other web apps, but only through my phone’s hotspot and only when the cell booster is on. Both are a constant draw on the battery. Our electronics are running low and we’ll need to charge the battery tomorrow. We spent the morning re-reading the generator manual and filling it with gas, fuel stabilizer, and oil for the first time. We only broke one plastic piece doing this. We turned on the generator and tested it with a cheap appliance. It worked as expected and the generator was quieter than anticipated. Tomorrow we hook it up to our entire rig. Today we took a group hike to Treasure Falls, saw part of the continental divide, and drove a dirt road up a mountain for a beautiful view of the area. I’m looking forward to charging everything tomorrow and possibly a soak in the natural hot springs! Our trip started in Virginia. From there we traveled South through the Eastern states, explored the entire Florida coast, visited 8 Texas cities, stayed a while in Arizona and California, and then went North through Nevada, Utah, and Colorado. This entire time I’ve worked as a Jira administrator, consultant, and speaker on the Strategy for Jira Tour. The tour highlight was speaking at the Atlassian office in Austin, TX and at Summit! 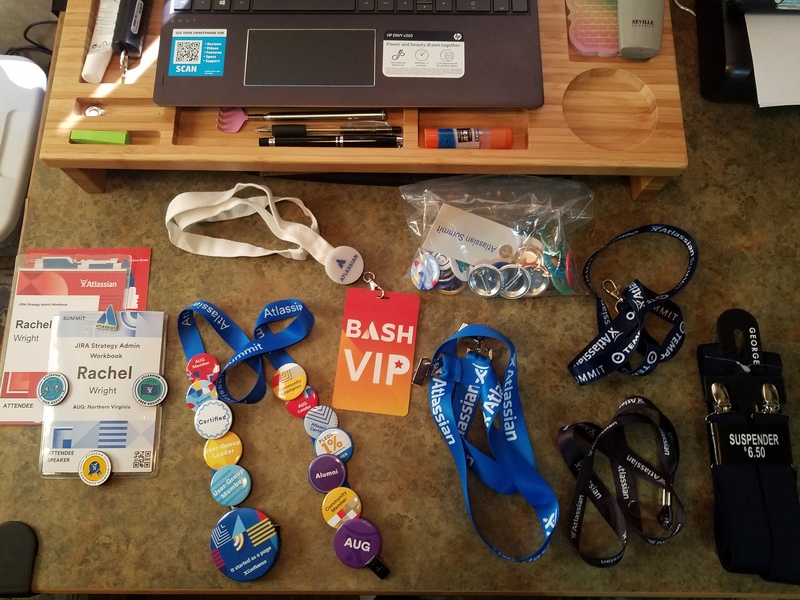 So what does all this have to do with Jira and Confluence? Plenty! Throughout my trip, I’ve had to guarantee my access to power and wifi in order to work, support the Jira Strategy Admin Workbook, and participate in the Atlassian Community. I need reliable access to Jira and Confluence for my consulting practice, for my volunteer work, and for my personal life. 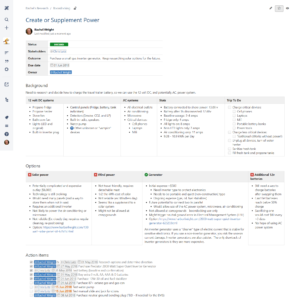 Without Jira, I can’t access my “to do” list, help Jira administrators clean up too many custom fields, or prepare to merge multiple applications. 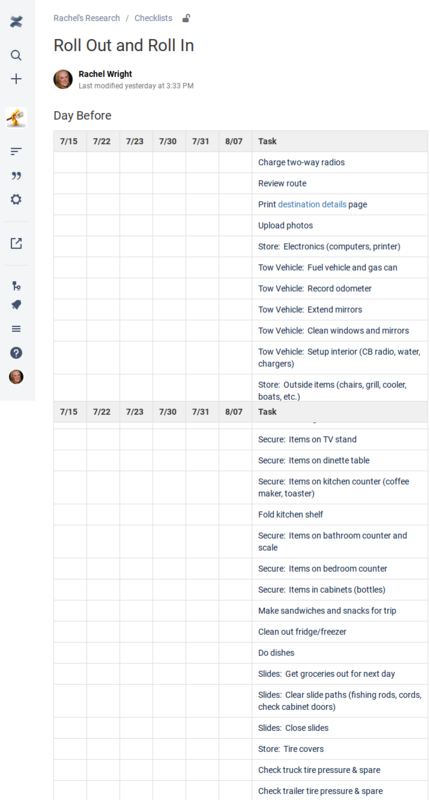 I track where we go in Jira and record the specific details of each location in Confluence. Now, I’ll need to do all that without the convenience of “full hookups.” We’ll need to bring our own water and store it – before and after we use it. Most importantly, we’ll need to find a way to generate our own power. There are a few power generation options so I used Confluence to research and make the decision. The travel trailer has its own 12 volt battery that’s responsible for the lights, water pump, fire and carbon monoxide detection systems. It also generates the spark for propane appliances, like the fridge, stove, and oven. The battery is constantly recharged when connected to city power but without it, it doesn’t last very long. We need a way to recharge it and heavily researched all the methods including: solar or wind power, gas or propane generator power, disconnecting the battery altogether (not sustainable), and even sacrificing one or a series of $80 batteries (not smart). For our first foray into boondocking, we purchased a small gas inverter generator. Our $500 unit won’t provide luxury. We won’t be able to use the microwave, air conditioning, or coffee maker. But doesn’t a coffee press make better coffee better anyway? It’s enough to periodically charge the 12 volt battery however so we can run a minimum amount of electronics. We’ll limit ourselves to the really important things: 2 cell phones, 2 laptops, and one wireless internet router for WiFi. We’ll open the windows if it’s hot, light a lantern if it’s dark, and generally try to live even more simply than before. It will be less “glamping” and more “camping.” I do hope we’ll have enough battery power to run a small fan though. We’ll see. We’ve been researching and learning about volts, amps and watts. I estimate it takes 65 watts to access a local Jira instance and 71 watts (computer + router) for a Cloud instance. I’m new to these calculations though and my estimates could be way off. Time will tell! Starting July 8, we’re “cutting the RV cord”. 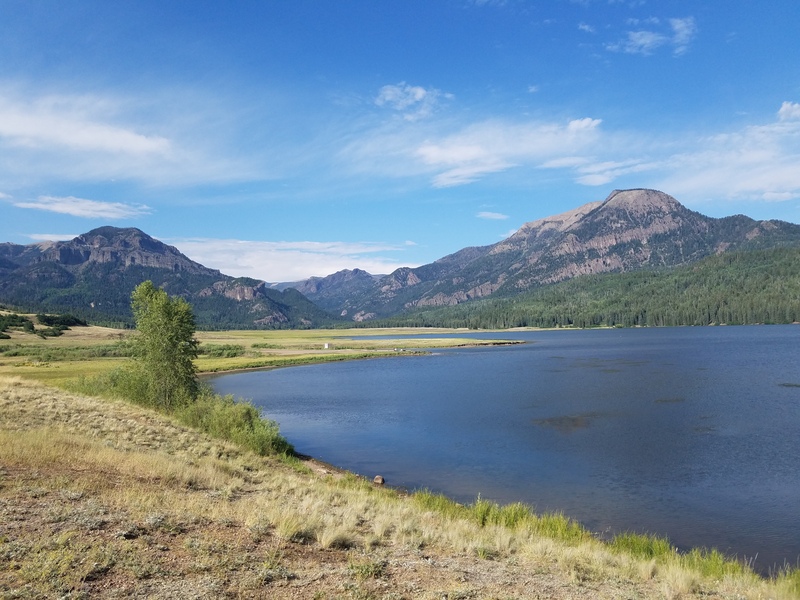 We’re going to the middle of a field in Pagosa Springs, CO to test our setup and spend a whole week “off the grid.” If all goes as planned, I’ll be doing all my favorite Jira and Confluence activities like always. I’ll let you know how it goes. Have you boondocked, dry camped, or gone “off grid”? Share your stories and tips in the Comments section below. This week, 24 non-Atlassians participated in the first Atlassian User Group (AUG) Leader ShipIt. Since we’re Atlassian customers, volunteers, and have work duties we can’t ignore, our hackathon lasted 3 weeks, instead of 24 hours. We worked nights and weekends to bring our ideas to life and then submitted our finished products as a three minute video. We were one of 10 teams that accepted the ShipIt challenge. Our team included six AUG Leaders from all over the country. We named ourselves “Atlas”. 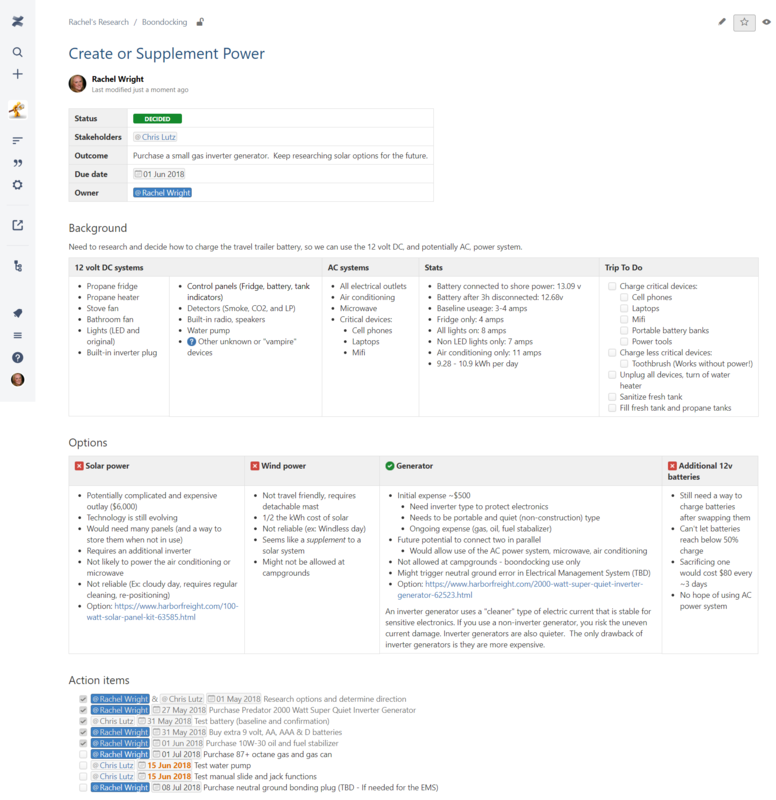 We wanted to solve a visibility issue that impacts the AUG program and we wanted to use Atlassian products to do it. We built a dynamic map that pulls its data from Jira issues! 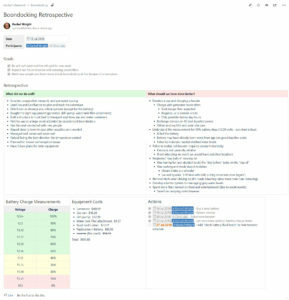 We started with a Jira project, where each user group is represented by an issue. The project has custom fields, like “Map Location” and “Group Size”, to hold information about each group. The project has custom workflow statuses, like “Active” and “Inactive”, to show the current state of each group. We used Jira’s REST API to retrieve issue data for only user groups in certain statuses. Next, we injected the JSON results into SQL 2016. We then restructured the data for map use. For example, we translated the plain text “Map Location” values into coordinates the Google Maps API would understand. Finally, we created a script that automates the REST API calls and the Geocoding of the locations. The script also generates an HTML file with all the user group data plotted. The process of updating the HTML file on the server is automated too. The file is uploaded to our Confluence instance and versioned through the REST API. It is also published to an external website, demonstrating additional viewing abilities. When a user group transitions to another status, or if any Jira issue data is updated, those changes are automatically reflected on the map! This includes changes to the group’s name, estimated user counts, and group contact information. The map requires no manual updates, which was a project goal. 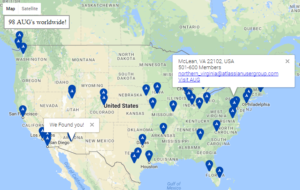 Clicking a map pin displays city information, like the group size, the city contact email address, and a link to the group’s website. 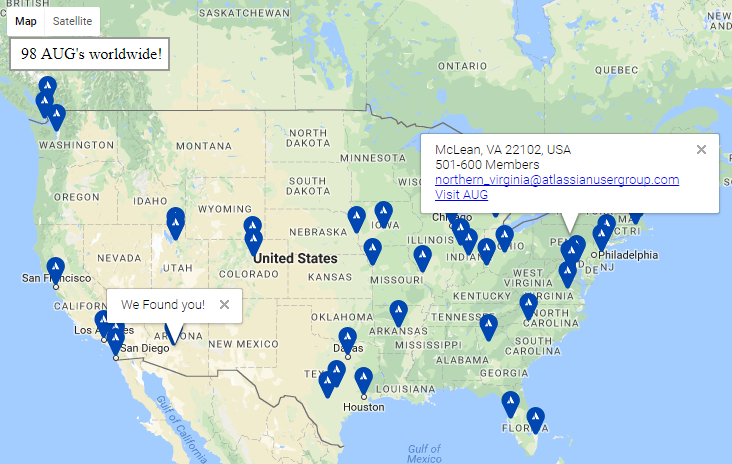 The map also automatically centers to your current location and counts the total number of active user groups displayed. 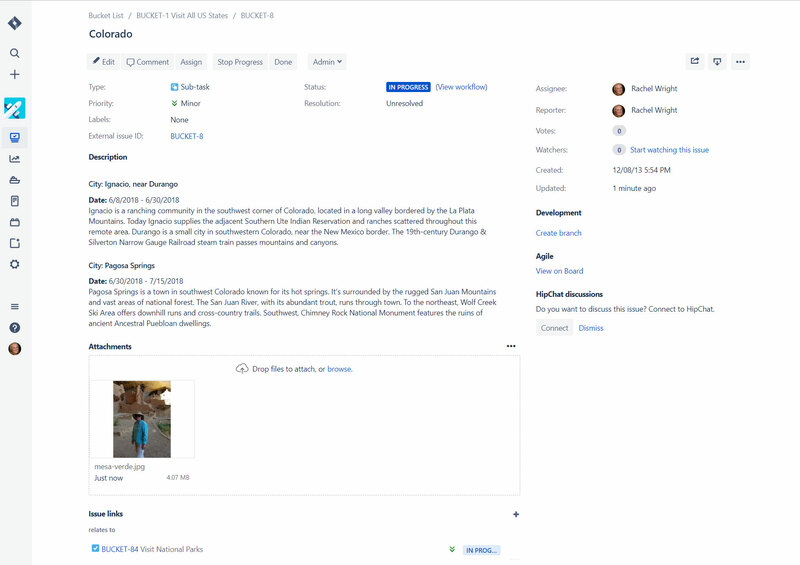 The look and feel is fully customizable and results can be embedded on other websites, including Confluence and Jira. Additionally, we used HipChat’s Botler service to create map entry point. In HipChat, if an AUG Leader types “an AUG in” as in “Is there an AUG in Nebraska?” a link to the map will automatically appear. See our creation in action with the three minute ShipIt video below. You can also demo our proof of concept live! and Jira to store all user group location and status data. We’re very proud of what we built and had an awesome first Atlassian ShipIT experience! 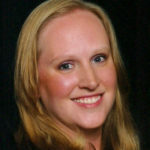 Rachel Wright, Author of the Jira Strategy Admin Workbook and member of the AUG Leader Council. 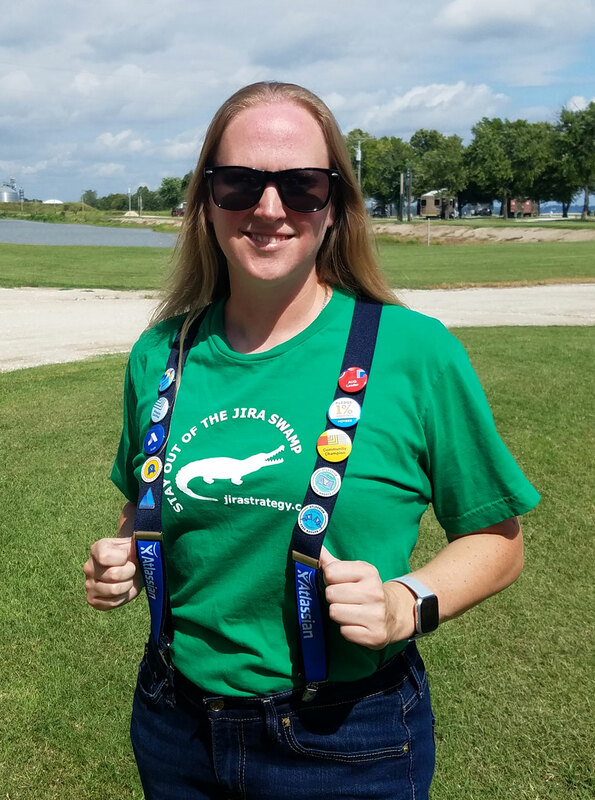 In April 2017, Rachel Wright joined Adaptavist’s Matthew Stublefield and Ryan Spilken to discuss JIRA administration, in the Mistakes Were Made episode, of the Adaptavist Atlassian Ecosystem Podcast. In this episode we explore how we got our start as JIRA administrators, utilizing test environments, unintended consequences of cleaning up your application, and ways to learn about JIRA administration. The Adaptavist Live! podcast highlights topics and events within the Atlassian Ecosystem and at Adaptavist. Matthew Stublefield and Ryan Spilken use their unique brand of humor to make technical topics interesting and understandable. Adaptavist helps the world’s most complex Enterprises get more from Atlassian software through professional services, Add-Ons, training and managed services.